Embrace Succulent, Aloe Vera, and Cacti Joy! If you love succulent plants, aloe vera, air fern kits, hens and chicks, succulent planter, succulent vases, cactus pots, flower pots for succulents, terrarium plants, suculentas plant, little seed collection, fairy garden plants, small cactus or cacti, you will find there are even more good reasons to love Hello Succulents! ✓ DOCUMENTED BENEFICIAL MICROBES - Comes ready to use and pre-mixed with vermicompost tea extract. ✓ ECO-FRIENDLY - Avoids use of any artificial ingredients, harnessing the primordial power of millions of earthworms. ✓ GREAT VALUE - Large quantity of super food-4.0 fl. oz. 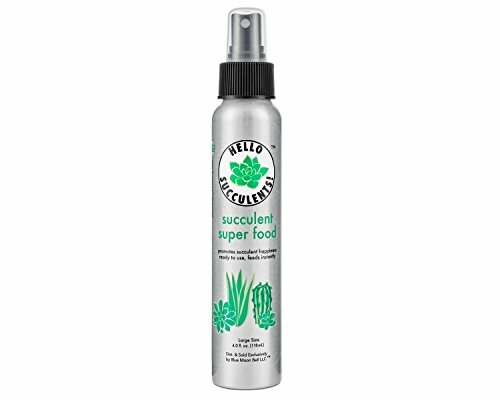 (118 mL)-sufficient to treat numerous live succulents. Instructions are included on the label to get you started instantly. Buy Now and receive Blue Moon Bell's 100% Money-Back Guarantee! We are so certain that this succulent super food will be perfect for your succulents that we offer a 60-day, no-questions-asked refund policy. FIND TIME FOR HOME - Hello Succulents will help you cultivate a succulent refuge at home. Nobody should have to experience the home as a source of anxiety. SUCCULENT, ALOE VERA, AND CACTI CARE FROM ALL-NATURAL WORM TEA - Crafted in Washington, USA, Hello Succulents is a liquid succulent super food. Contains beneficial microbes to augment your general-purpose fertilizer. MAINTAINS SUCCULENTS' NATURAL BEAUTY - Hello Succulents will not burn or deface your plants' natural beauty. Also for use with live aloe vera plant, terrarium (e.g., the best fairy garden kit), potting soil mix, chicks and hens, cactus seeds or cacti, jade, or christmas air fern or ferns. Grow succulents (or suculentas plants) as indoor, house (or houses), or office plants decor, or simply use a planter pot with drainage (large or small, gro square or round planters or pots). AN AURA OF SUCCULENT BLISS - Wedding arrangements, bulk table dressings, miracle gifts, gardens, a wreath or wreaths, or containers. A simple but effective spray solution with easy directions on the bottle label. 100% MONEY-BACK GUARANTEE - Hello Succulents is backed by our 100% guarantee with customer support available for any questions. If you have any questions about this product by Blue Moon Bell, contact us by completing and submitting the form below. If you are looking for a specif part number, please include it with your message.